Dental students from the University of Dundee are taking the fight against rotten teeth to local schools. 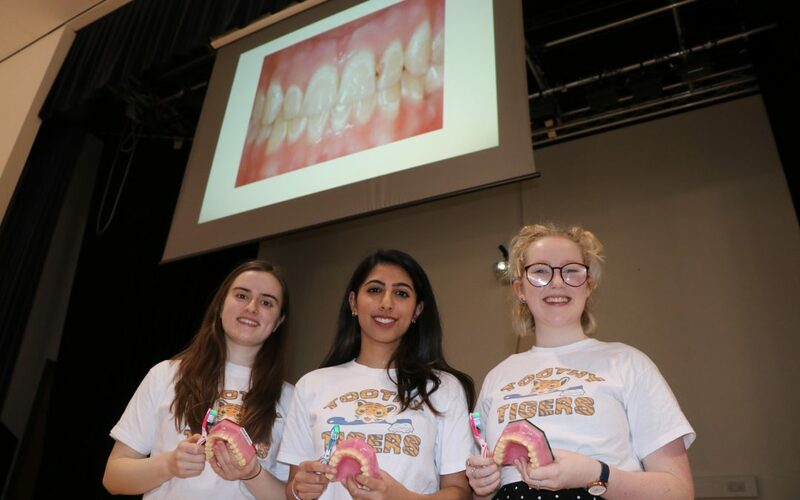 Toothy Tigers is a student-led initiative that warns youngsters of the perils of not looking after their pearly whites. Despite high-profile public health warnings, the amount of sugar consumed by children continues to concern health experts. So how do you try to change attitudes that have endured for generations? “We try and make it fun,” says Taranjit Kaur, a final year dentistry student. “The Toothy Tigers has been going for several years now but I started with the project two years ago. Taranjit was recently part of a Toothy Tigers group which visited St Pauls’ R.C. Academy in Dundee. Accompanied by her team members Natalie Hytiris, Jill McMurray, and Megan Donaldson, the team met with around 200 P7 pupils from local primary schools, using a series of workshops and activities to encourage the youngsters to look after their gnashers. “Usually when we go to schools we divide the students into smaller groups and introduce them to some activity sessions that focus on dental health,” she continued. While effective brushing is one aspect of good dental health, many problems are caused by poor diet, particularly excessive intake of sugary drinks and snacks. “Most of the kids know that sugary snacks and drinks are bad for them, but a lot don’t know how to brush properly and how often they should be doing so,” added Taranjit. “We want our sessions to be as interactive as possible. We have models so that they can take impressions of their teeth, while with younger ones we try and play games and use our puppets so they don’t lose interest. “It’s also a great way of removing some of the myths around visiting the dentist. Sometimes children might not want to ask a question on a visit to the Dental School as they don’t want to appear ignorant, so our visits are a great opportunity for them to learn more about their teeth, and sometimes we even get questions from the teachers as well.